Before the Catastrophe, Not After! How do you bounce back from bad news, a lost job, a broken heart or other of life’s crises? Well, obviously it can be difficult. And you can’t prepare for something you don’t know is coming, right? There are some things we can all do: save money for an emergency, be sure we use security measures in our daily life, watch our diets and exercise. But these aren’t guarantees. I found myself in this kind of situation. I received news that wasn’t good. After processing the news and facing my new reality, I looked for a path or plan to move forward. Unexpectedly It was unexpected when it appeared. My two daughters had both read a book they really enjoyed and they shared it with me. One day when I was on the exercise bike reading the book, I found this quote which moved me. I had no life of my own, I didn’t have the first clue as to who I was or what I wanted. It really never occurred to me in all those years of marriage that I needed to have a little tiny place for me to have my own things going on in life. Before the catastrophe, not after! After was too late. I was waiting to die, but I didn’t die, God isn’t ready for what little there is of me yet. w I see that it’s like saving money, you can’t save for when you get laid off, after you get laid off; rather, you have to save while you have a job and the money is still coming in. Life is like that, you have to DO while you are able to think of what you want, what you like, what needs it will fill, how it will enhance your life, how it will help you to maintain you, so that you have some reserves when crunch time comes. The writer was obviously dealing with a broken marriage. But the rest of the quote provided me with inspiration for my direction. While the writer was looking at the more practical preparations, I took away the value of doing now things that I might regret missing later. I love the line, “Before the catastrophe, not after!” I want to spend time now with the people I love, I want to send little notes to my children so that they have hand-written proof of how they were valued. I want to make sure my husband has no regrets and that we build a life that is strong enough to stand against the storm. I’m trying new activities. I laugh with joy as much as possible. I’ve quizzed God on the why and then quickly balanced it against what he’s else he’s given me and continue to pray in grateful thanksgiving. These are the reserves I want when crunch time comes. Thanks, Ms. Rubin, for including this message which has helped me build a path forward that will be uniquely mine. Categories: Life, Uncategorized | Tags: family, friendships, Happy life, life | Permalink. Martin Luther King was assassinated when I was in the 5th grade. We learned all about what he had lived for and his value to our country. We mourned his loss then, and still do now. His speech was powerful as were the lessons learned by how he led his life. He became, and remains I believe, a true American hero as much as Jefferson or Roosevelt. I would have loved to have joined in today’s celebrations of the 50th anniversary of King’s famous speech in Washington, DC. But here is my truth: I wasn’t invited. Rather than celebrating as a united country, we are fractured and the day and its celebration seemed to belong only to liberals and African Americans. Yes, it’s been covered in the press. But, although there were local ceremonies, I don’t know where they were. I wish communities had advertised and encouraged widespread participation, that they would not have twisted this day into a political advertisement for the Democrat party. The average non-black citizen of the United States celebrates this speech and the life of Martin Luther King. Conservatives, too,rejoice in the progress we’ve made towards racial equality exemplified by Supreme Court justices Thurgood Marshall and Clarence Thomas, presidential appointees Condoleezza Rice and Colin Powell, former Maryland governor Michael Steele and former Presidential candidate Herman Cain, former congressman J.C. Watts and surgeon and commentator Benjamin Carson. All demonstrate greater inclusion in our country’s political life. We look at the famous and wealthy athletes and entertainment personalities (think Oprah or Will Smith or Bill Cosby) and see their impact on this country’s culture. We look at Prince Georges County in Maryland and see a majority African- American community (in 2010, about 65%) which is prospering with a median income in 2008 of $71,696 ($94,360 for families). None of us can walk alone. But how I wish we’d all been invited to walk together yesterday. Categories: Uncategorized | Tags: Venting | Permalink. Earlier, I wrote about my cousin, who had been waiting for a heart for a transplant for quite awhile. Then, today he finally got the call and he quickly traveled to the transplant center and was prepped for surgery. Unfortunately, as the medical team prepped him and planned the surgery, trouble reared its head in the form of his gall bladder. An infection was traced to a possible stone. The infection made him not suitable for a transplant so Victor’s long-awaited heart is now to be someone else’s blessing. He’s now undergoing surgery to deal with the gall bladder. To have waited so long to only discover its not to be his, you can imagine that his mood has gone from joy and hope to disappointment. And yet, he says he’s pleased for the recipient and their family and praying for a successful outcome. And as he prays, we hope that another family, in the throes of their own personal tragedy, considers giving the gift of life. Remember: www.donatelife.net . As I write this blog post, there is a group of gifted surgeons, nurses and other support staff replacing the heart of my cousin with the heart of someone no longer with us. This heart is such an amazing gift from a family you know is grieving. Victor’s immediate family is gathered around at the hospital and praying like crazy for a successful outcome. These are the cousins I wrote about a few posts ago,” The Good Cousins”. Please keep all of them as well as the donor’s family and the medical personnel making this miracle happen in your thoughts and prayers. Are you an organ donor? Go to www.http://donatelife.net/ or www.organdonor.govin the United States to find out how to make another miracle happen. Then be sure your family and friends know your intentions. Categories: Life, Organ Donation, Uncategorized | Tags: family, life, Organ Donation | Permalink. When I was expecting my first child, I read that it was important to read to your children from the very start. And read aloud I did, right from the start, as recommended. My mother-in-law just about had a heart attack when she walked in on me reading aloud to my infant from some bodice-ripping romance novel I had around the house! But eventually we graduated to board books, like Pat the Bunny, filled with rhymes and textures and Goodnight Moon with the rhythms and rituals of bedtime. When the next child joined the family, we still read together during the day but each had their own books read to them at bedtime. ” Have you been a good girl? Have you been a good girl? Have you been a good girl? Well, why would I want to be bad at the zoo? And should I be likely to see if I had? Rhyme and humor certainly get children’s attention. But some books have lines and morals that stay with you for life. My son called home from college one afternoon. A classmate in one of his engineering classes had told the professor and class about what a bad day he had. The professor replied, “Some days are like that”, to which my son added, “Even in Australia!”. To my son’s amazement, no one else in the class got it. Did you? If not, its not too late to read Alexander’s Terrible, Horrible, No-Good, Very Bad Day. But hurry! Other must-reads for lines and morals include American folk tales, featuring such gems as “Don’t throw me in that briar patch”, which is actually a sly way to convince someone to do the very thing you want them to do. Reading books aloud is a great way to teach your children to read. As they hear stories that they enjoy repeated over time, they begin to decode and sound out some of the simple words. When my older child learned how to read, her younger. very competitive brother memorized a simple book. Every time big sister demonstrated or practiced her developing reading skills, he pulled that book off the shelf and performed. Reading aloud became such a comfort ritual in our house that when we faced a sudden loss of a loved one, the children (teens to young adults by then) gathered together with me while we read familiar childhood tales. If you’ve also read to your family, share your story and favorite reads. If you haven’t, give it a try! Categories: Advice, Parenting, Uncategorized | Tags: advice, family, Parenting, Reading | Permalink. Hurricane Sandy has me stuck indoors today so I have some time on my hands to find a new topic to write about. I was flipping through pages of an old scrapbook and found a small newspaper article about a new controversial cafeteria plaque being installed in the US Department of Agriculture. “Perfect”, I thought, “Its just the right kind of perverse story for today.” So I apologize if you know the tale but if not, here’s the tale of Alferd E. Packer. Alferd E. Packer was a prospector who sometimes led groups west. He was born in Pennsylvania in 1842 and later moved to Indiana with his family. Alferd joined the Union Army during the Civil War, enlisting in Minnesota. He was discharged for epilepsy but enlisted again in Iowa. Discharged for the same reason again, Alferd decided to try his hand at prospecting. In 1873, he was hired to lead a group of 20 men on a prospecting trip through the San Juan mountains of Colorado. He claimed to have experience and could lead them to valuable gold ore but there doesn’t seem to be evidence of that. Heading out, they stopped at the village of Chief Ouray, known as White Man’s Friend, warned the group that they’d be smarter to wait out the dangerous winter weather and begin again in the Spring. After hearing that, Packer and five others decided to continue; the others to wait it out. Packer and the others quickly got lost in the mountains and ran out of their provisions. They were lost for 60 days. The rest of the group looked for them when they started out again in early spring. Then in April, Packer walked into a saloon in Colorado looking healthy and ran into members of the second party. He told them various versions of what had happened. In one, he’d been wounded and left behind. 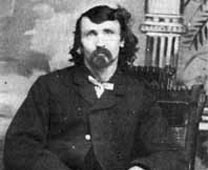 In another, one of the others had gone bezerk and shot other prospectors; Packer claimed he killed him in self defense. A few months later, strips of human flesh were found on the trail and, in August, the camp of the 5 missing men was found. Packer was arrested by escaped. He was later arrested again and put on trial. When I came back to camp after being gone nearly all day I found the redheaded man [Bell] who acted crazy in the morning sitting near the fire roasting a piece of meat which he had cut out of the leg of the german butcher [Miller] the latters body was lying the furthest off from the fire down the stream, his skull was crushed in with the hatchet. The other three men were lying near the fire, they were cut in the forehead with the hatchet some had two some three cuts – I came within a rod of the fire, when the man saw me, he got up with his hatchet towards me when I shot him sideways through the belly, he fell on his face, the hatchet fell forwards. I grabbed it and hit him in the top of the head. I camped that night at the fire, sat up all night, the next morning I followed my tracks up the mountain but I could not make it, the snow was too deep and I came back, I went sideways into a piece of pine timber set up two sticks and covered it with pine boughs and then made a shelter about three feet high, this was my camp until I came out. I went back to the fire covered the men up and fetched to the camp the piece of meat that was near the fire. I made a new fire near my camp and cooked the piece of meat and ate it. I tried to get away every day but could not so I lived off the flesh of these men, the bigger part of the 60 days I was out. “…our supplies were exhausted by the time that we reached the Green River, at the head of the Colorado. And now, my kind friend let me impress upon you the painful fact that thus early in our journey we were suffering most terrible from the pangs of hunger…Starvation had fastened its deathly talons upon us, and was slowly but most tortuously driving us into the state of imbecility; in fact, Bell, the strongest and most able-bodied man of our party, had succumbed to the power of mental derangement and was causing the party to be very much afraid of him, as well as that which they felt to be the inevitable doom of each, mentally.In the morning I ascended the mountain for the next purpose of ascertaining if there were any visible signs of civilization on the opposite side…As I neared the camp on my return I was confronted by a terrible sight. As I came near I saw no one but Bell. I spoke to him, and then, with the look of a terrible maniac, his eyes glaring and burning fearfully, he grabbed a hatchet and started for me, whereupon I raised my Winchester and shot him. The report from rifle did not arouse the camp, so I hastened to the campfire and found my comrades dead. Can you imagine my situation – my companions dead and I left alone, surrounded by the midnight horrors of starvation as well as those of utter isolation? My body weak, my mind acted upon in such an awful manner that the greatest wonder is that I ever returned to a rational condition. Alferd E. Packer was put on trial, the first case of cannibalism tried in the United States court system. As it turns out, he was never hung. The Colorado Supreme Court reconsidered his case and changed his sentence to 40 years. If you remember, I introduced this story by mentioning a controversial plaque at the cafeteria of the US Department of Agriculture. In the 1970s, employees of the US Department of Agriculture, disgruntled about the quality of food served in the cafeteria, spent their own money on a plaque renaming it. 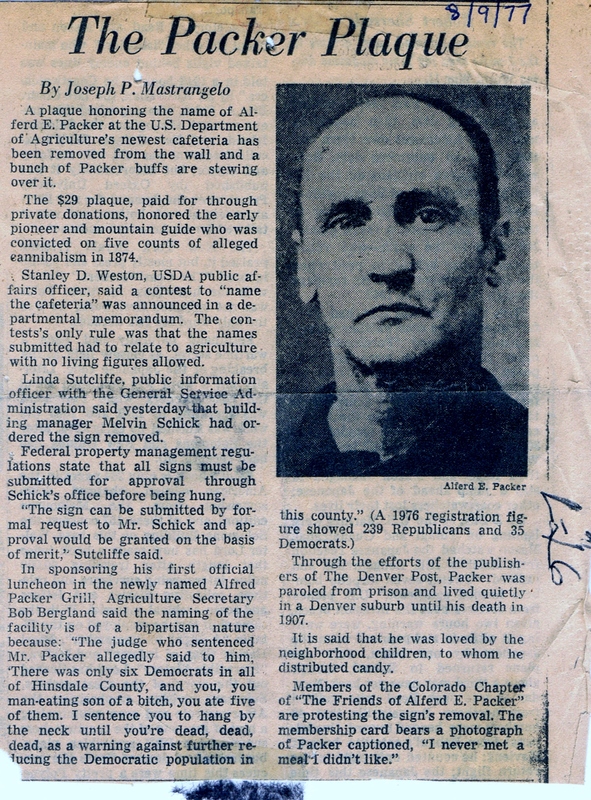 The plaque declared it ” The Alferd E. Packer Memorial Grill”, proclaiming that his case “”exemplifies the spirit and the fare of this Agriculture Department cafeteria.” When the Agriculture Secretary found out who Alferd E. Packer was, the plaque was removed. What follows is the article I clipped in 1977 from the Washington Post which was what got me looking up Mr. Packer today. What does it say about me that I’ve had this clipping for over 30 years? Categories: History, Uncategorized | Tags: History | Permalink.